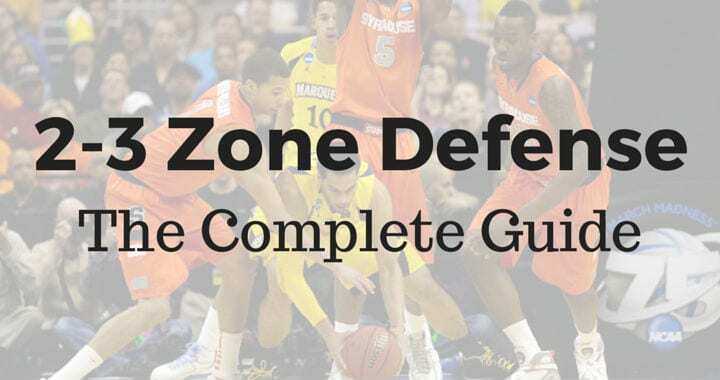 The 2-3 zone defense is by far the most common zone in basketball and is more than likely the specific formation that will come to a coaches mind when they hear the term ‘zone’ relating to basketball. The 2-3 zone defense involves two players across the top of the zone near each high post; these players are referred to as the ‘guards’ (1 and 2), two players a step outside of each block; known as the ‘forwards’ (3 and 4), and a player in the middle of the key referred to as the ‘center’ (5). 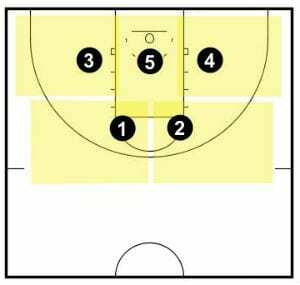 The areas of a 2-3 zone defense. The biggest difference between a man-to-man and a zone defense is that instead of being responsible for a certain offensive player, all defensive players are instead responsible for an area of the court. The image shows the main areas each position is responsible for but keep in mind that they definitely do overlap at times depending on where the ball is on the court. Make no mistake, a 2-3 zone defense doesn’t allow your team to rest on defense. A great 2-3 zone defense requires just as much effort as a great man-to-man defense. Jim Boeheim at Syracuse has won nearly 1,000 games and made a career primarily out of teaching and running the 2-3 zone defense. While I don’t recommend using this as your primary defense, the 2-3 zone is a fantastic change-up defense to throw a different look at your opponent and see how they respond to it. 1. Protects the Paint – The 2-3 zone is a great defense to keep the ball as far away from the hoop as possible. This is accomplished by the center basically never leaving the paint and always having help very close. 2. Teams Aren’t Prepared for a Zone – Every team prides themselves on their man-to-man offense and set plays. How often do most coaches practice their zone offense or set plays against a zone? Barely ever. Most coaches will only have a couple of practices to prepare themselves for your 2-3 zone defense. 3. Will Limit Fouling – Due to a combination of factors, players simply don’t foul as much while playing in a zone defense. 4. Teams Aren’t Patient – The number one way to beat a zone is with smart passing and being patient until you get a good shot. Well I have good news, not many teams are patient. You’ll find most teams rush and will often take contested shots, or they’ll turn the ball over trying to make fancy passes against the zone. 5. Tempo Control – A good zone defense can dictate how fast the game is played. Want a faster tempo? Play a more aggressive trapping zone. Want to slow the game down? Play a patient zone with minimal traps. 6. Fast Break Opportunities – With both guards always at the top, the positions of a zone put players in great position to fast break many times throughout the game. 1. Great Outside Shooting – The biggest disadvantage of a 2-3 zone defense is that it can struggle against great outside shooting teams. It’s the trade-off this defense makes in order to pack the paint so well. 2. Rebounding – In a zone players don’t have specific match ups, they guard areas. This can make rebounding a problem at times. 3. Offense Chooses Matchups – Though there will always be great help if they get beaten off the dribble, if the offense want to match their best player up against your worst player every time down the floor, they can. 4. Playing from Behind – If you’re playing from behind teams can use up all of the shot clock on each possession. If there’s is no shot clock, well, it looks like you can’t play zone anymore. 5. A Loose Link – The zone relies heavily on the team working together as a unit. If any player doesn’t fulfil their role, other defenders will have to compensate and it will lead to open gaps and usually easy scores for the other team. Who Should Use a 2-3 Zone Defense? Let’s get this myth out of the way early. Too often I hear coaches voice that “a 2-3 zone defense should ONLY used by big and slow teams”. This is stupid, and definitely not true. The coach just has to make a few tweaks to the defense depending on the personnel you have on your team. For example, if you do have a big and slow team, the most effective way to use a 2-3 zone may be to play a patiently, limit trapping, and force the offense to move the ball around until they can find a gap or an open shot. On the other hand, if you have a small and fast team, the most effective way to use a 2-3 zone may be to trap often, force the offense to take quick shots and make rushed decisions, look for steals, and keep the tempo of the game as fast as possible. Any team can use the 2-3 zone defense, you just have to adjust how you run the zone to best suit your personnel which we’ll talk about later on in the article. Before we get into the particulars of the zone, I want to share with you the four crucial aspects of an effective zone. Keep these in mind while you’re reading through the rest of the article. Great passing is one of the weaknesses of the zone. If teams are able to effectively make passes inside the zone the whole floor opens up for the offensive team. The defense must keep their hands up and active at all times to discourage passes inside and get deflections. Being in stance makes it quicker to react when a pass is made or a potential steal opportunity arises. Everyone must move on the flight of the ball and not on the catch. Moving on the flight of the ball means we’re in defensive position when the offensive player receives the basketball. The quicker your team can get to the player with the ball the better your defense will be. Communication is critical to every defense and that includes the 2-3 zone. Players must communicate screens, cutters, bumping, who’s got the player with the basketball, etc. All great zones have great communication. This point may seem like the odd one out but it must be included. Do not allow layups against your zone. Players must not make it easy for the offensive team inside. Now we’re going to go through where your players should be positioned depending on where the ball is on the floor. Basic setup when the ball is at the top of the key. When the ball is at the top is when we see the basic 2-3 zone defense structure. Two guards are at the top of the zone (1 and 2), two forwards a few steps out from the block (3 and 4), and the center in the middle of the key (5). All that we want to happen from this position is for the point guard to pass it to either of the wing players. We DO NOT want the ball to go from this position into the high post area. That can happen by the point guard attacking through the middle of the guards or passing to a player in the high post. We discourage both of those options by making sure the guards are close enough that they are nearly able to touch hands. Note that in a 2-3 zone defense we don’t actively deny the pass to the wing players. Instead, we rely upon players moving on the air time of the pass and a tactic we call ‘bumping’ (I’ll discuss this is detail a bit later in the article) that involves the forward on the ball-side quickly closing out on the wing player before getting bumped by the guard who quickly recovers to the wing. Positions when a player is forced to take the ball. Notice 2 is responsible for the high post. If the point guard at the top of the key is a good shooter and within shooting distance, we must respect the shot by one of the guards playing them. Whichever guard is closest to the ball handler must call out ‘Ball!’ or ‘Mine!’ to prevent confusion. When this happens the other guard is now in charge of denying the high post while the on-ball defender puts pressure on the point guard. The same rules apply on the wings, on any pass to the wing player the forward must help out and then be bumped back by the guard. As for the low players, notice that the forwards are a little higher than usual. This is to make the close out to the wing player quicker because it’s a shorter distance. Structure when ball is on the wing and the corner is free. After the ball has been passed to the wing player and the forward has been bumped down this is how we should be set up. The on-ball guard (2) should be in either a neutral stance or forcing the ball towards the baseline depending on the coaches preference. I prefer to channel the ball towards the baseline as this makes it harder to pass to the high post and forces the offensive player towards our bigger defenders. Structure when there is a player in the corner. 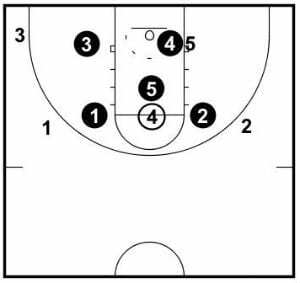 The ball-side forward (4) should be in the short corner or fronting the low post player if there is one. The weak-side guard (1) should be near the closest elbow if there’s no player in the high post, or denying the pass to the player in the post from the high side. The center (5) is behind to half-fronting the post player. 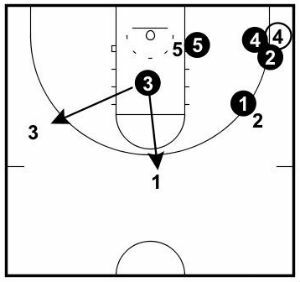 The weak-side forward (3) should be a few steps up the lane preparing to pick off any skip passes the player with the ball might make. Corner structure with the 2 guard sagging in. The image shows the normal positions for when the ball is in the corner. The ball-side forward steps out and pressures the ball. The center fronts the post. The ball-side guard is sagging into the lane to prevent a pass inside and to discourage the drive. The weak-side guard is denying the high post. 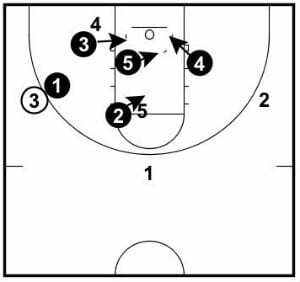 The weak-side forward is up the lane getting ready to pick off the skip pass. You can choose for the guard to sag into the lane, allowing the simple pass from the corner to the wing while preventing the pass inside or dribble penetration. You can get the guard to completely deny the pass back outside and force the corner player to make a decision and be aggressive. If you have an experienced team, you could use the second option against certain weak players on the other team and force them to make a decision. Structure when the ball is in the high post. When the ball makes it into the high post we’re now in a very vulnerable position. 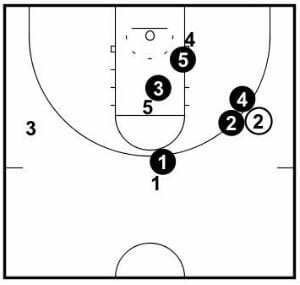 If the offensive team have put a good passer in the high post (a wise decision), every other offensive player on the floor is now only a short pass away and a threat for a quick catch-and-shoot. That’s why we need to keep it out of there! The center (5) immediately sprints up to play the ball. The two forwards (3 and 4) must immediately ‘pinch’ in and take the closest player on their side of the basket. When the ball is at the high post we’re in a vulnerable position for a high-low pass for an easy layup. We must not allow this pass! 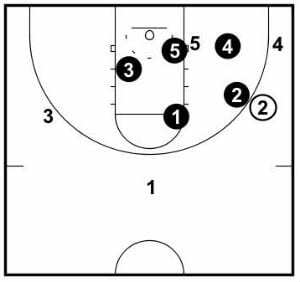 But at the same time, the forwards must be prepared to sprint out to the corner to defend the three-point shot if the pass it made to there. The two guards (1 and 2) must close in to the ball and try and force the high-post player to pass the ball out, but be ready to sprint out and defend the wings if the pass is made to either one. As you can see, it’s very tough for a zone when the ball makes it into the high post. The best way to defend it is to not let it get there in the first place! As referred to earlier in the article, bumping effectively is absolutely crucial to running a great 2-3 zone defense. You see, the problem with a 2-3 zone is that the two guards at the top are responsible for guarding three positions around the perimeter; the top of the key, and the two wings. 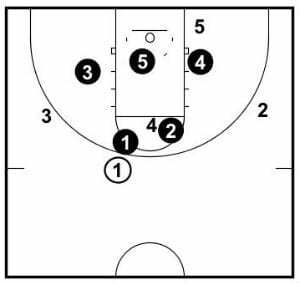 We run into problems on passes to the wing, skip passes, and ball reversals, where the offensive wing players may be left open while the guard quickly recovers to them; long enough that they’d be able to take an open shot. To combat this, we have the closest forward help out by closing out on the wing player to prevent the shot, before getting bumped back down to their normal position when the guard responsible for that area arrives. This help from the forwards allows two guards to play against three offensive players on the perimeter. Notice that when the ball is reversed from one side to the other the 2 guard is stuck having to guard the 1 and 2 at the same time when the pass is made. He is helped by ‘bumping’ of the 4 who temporarily helps out while 2 sprints and recovers to the offensive 2 guard. Bumping in a ball reversal. It’s the same situation if there is a skip pass from wing to wing. Since the weak-side guard is denying the high post, it’s a long way to recover if there is a skip pass thrown. To help this, the ball-side forward helps out until the 2 guard can bump them back down. Bumping on a skip pass. 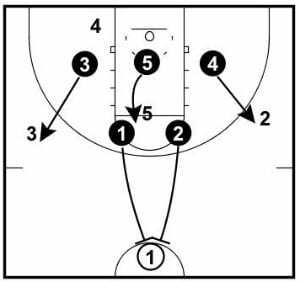 3, 5, and 4 crash their respective sides of the hoops while 2 gets a body on the offensive 5 player. Rebounding must be a constant emphasis when coaching a 2-3 zone defense. Since your players are guarding an area and don’t all have specific players, your team is at a distinct disadvantage compared to a man-to-man each time a shot is put up. Rebounding is an area that you must judge differently on each team you coach and there’s not one correct answer. If you have a bigger team, then you may only need your forwards and center to rebound and your guards can leak out for fast break opportunities. Although, if you have a smaller team, you might require everyone to crash the boards. You have to decide on your own philosophy regarding rebounding depending on the personnel of your team. Either way, there will always be gaps and a zone will allow more offensive opportunities than a man-to-man. This can lead to easy put-back shots or the kick outside to open shooters. All we can ask is that our players box out, are relentless pursuing rebounds, and do their best to secure the basketball. Trapping is very effective for a zone defense. Here we’re going to discuss the different types of traps you can use in a 2-3 zone and I’ll also include how often I think you should use each one. Depending on the amount of traps you use and where they are will play a big factor in the tempo of the game. It’s important that the players don’t foul on the trap and they force the offensive player to throw the ball high over the trap to give your other players a chance to steal the ball. Stress to your players that the steal doesn’t often come directly from the trapping players, it comes from the interception by the other defenders. Trapping the point guard as they cross half court. The first trap you can use is on the point guard right as they come across the half-court line. This is a surprise trap and should only be used a couple of times per game. Usually out of a time-out or in a late game situation when you desperately need a steal. You can also use this trap against weak or unconfident ball-handlers. As soon as the ball-handler crosses half court everyone must act at exactly the same time. This is crucial to running this trap effectively. We don’t want to give away what we’re doing or give them an easy pass out of it. The top two guards (1 and 2) must sprint at the ball-handler with high hands to prevent easy passes over the top and then trap him aggressively. 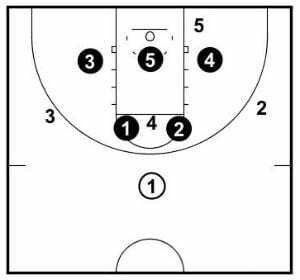 The two forwards (3 and 4) immediately sprint out to deny the wing players as this is where the point guard will often look to pass first. The center (5) is left guarding two players. 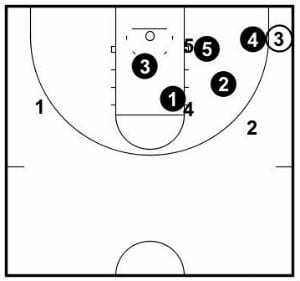 Most likely one in the high post and one in the short corner or the corner. The center has the toughest job and must try and predict where the pass will be made and play the ball accordingly. Be aware that you may get burned when running this trap. The offensive team could end up with an easy layup. But I’ve found if used at the right time and against the right player, this trap can be very successful. The trap on a wing from a 2-3 zone defense involves the ball-side forward and the ball-side guard. Instead of bumping like usual, the forward (4) doesn’t retreat and we aggressively trap the wing player with the forward and the ball-side guard (2). The center (5) fronts the post and is ready to sprint out and pick off or defend the player in the corner temporarily. The weak-side guard (1) denies the closest pass to the wing player, usually the point guard. And the weak-side forward (3) is trying to read the other players and pick off any skip pass that may be thrown. I’m not a big fan of trapping on the wing as I find the offensive player usually has enough options to make an easy pass out of it and then you’ll find your team in bad positions. But it might be something you might want to throw in randomly and catch the other team by surprise! BFC Recommendation: Use very rarely. Occasionally as a surprise, if needed. The corner trap in a 2-3 zone defense is by far the most effective trap you can use in a 2-3 zone. The offensive player with the ball is forced to make a very long and high pass in order to get the ball to a teammate if the trap is performed correctly. When the pass from the wing is made to the player in the corner, the ball-side guard (2) immediately follows the pass and will trap the player with the forward (4) that is closing out. 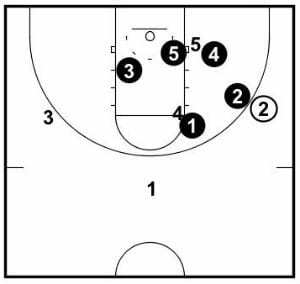 The center (5) must front on the post when the ball is in the corner. The weak-side guard (1) sprints all the way across the court to deny the easy pass back to the guard. And now it’s up to the weak-side forward (3) to keep his eyes on the two other players and anticipate the high pass that will be made. He must be in line with the lowest of the two players to prevent a lob or back-door pass. 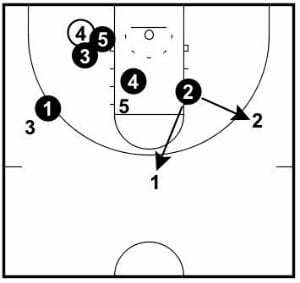 The benefit of this trap is that after you get a few steals and make it tough for the offensive team, they’ll simply stop passing it to the corner because they don’t want to be trapped. This makes it much easier to play a 2-3 zone defense. BFC Recommendation: Trap the corner every time if you have a team that can. You might have noticed that we skipped the short corner/post section when we were going over general positions. That’s because we ALWAYS trap the short corner and post. So I saved explaining it until we got to the section on traps. In a 2-3 zone defense, we always want to keep the ball as far away from the basket as possible. For that reason, when the ball is passed into the post or short corner, we must immediately double and get the ball out of there! This trap also occurs on all baseline drives to the ring. When the ball gets into the short corner or the post it must be immediately doubled by the center (5) and the closest ball-side forward (3). The weak-side forward (4) must now look after the paint. The player does this by coming across and making sure there isn’t anyone flashing down from the high post (a common pass). The ball-side guard (1) denies the easy outlet pass to the guard on the perimeter. The weak-side guard (2) is now playing the interceptor with the other two players and should back down as far as he needs to in order to see both players. The main goal we want out of this trap is for them to pass the ball out and we can set up our defense again. BFC Recommendation: Trap the short corner/post every time. 1. Ball Pressure – Ball pressure will depend on how aggressive of a zone your team is playing. Don’t be afraid to get right up on players and force them to drive or make a lobbed pass that may be picked off. 2. Disguising a 2-3 Zone – You can disguise a 2-3 zone defense by having your point guard play full court defense while your other guard plays in the high post. The second guard takes the first pass using bump help from the forwards and then the point guard falls back into their position. This is a great way to disguise a 2-3 zone or force the ball to a particular player or side of the court. 3. Run Shooters off the 3-point Line – As we’re stuck closing out often in a 2-3 zone, if you line up against a great 3-point shooting team, run the shooters off the three-point line and make them put the ball on the floor. The strength of the zone is in the key so there will be help. 4. Scouting Other Players – The more advanced your team, the more you should look at scouting the opposition and making adjustments depending on certain players. Who’s the shooters? Should you deny the ball to a certain player? Should you immediately trap a certain player every time they touch the ball? Should You Use a 2-3 Zone in Youth Basketball? Yes, it’s very effective in youth basketball. Yes, you’ll win more games in youth basketball. No, you still shouldn’t do it. I’m not going to get into depth on the topic in this article (I’ll save that for a later post), instead, if you want to read further on the subject, read this article from Breakthrough Basketball and make sure to watch the video by Stan Van Gundy. If you’re looking to add this defense to your team’s arsenal, there are three things you must decide on before implementing the 2-3 zone with your team. 1. Decide how often and where you’ll trap. 2. Decide how aggressive your players will be on the ball. 3. Decide how many players will crash the boards. These answers to these three questions will decide at which tempo you play the game. If you have an athletic and quick team you should be trapping often and being aggressive on the ball. If you have a slower team you can trap less and be patient until the other team takes a silly shot. Congratulations, you’ve made it through a 4,000+ word article on the 2-3 zone defense and should now have a thorough understanding of how it works. As stated earlier in the article, I don’t recommend you use this as your primary defense, but it’s a great defense to throw at your opponent and see how they respond to it. If it works, keep using it. It’s not a lazy defense if played correctly and will definitely challenge your players mentally and physically, but the benefits can be enormous. Some teams simply can’t play against a 2-3 zone defense, so use it! Coaches: At what age should we start implementing the 2-3 zone defense into competition?